I started out with sewing (by hand) 18 hexagons for the water and 19 hexies for the land using the quilt-as-you-go technique. I then used my machine to sew them to a darker blue background using a blanket stitch. The number markers, the roads and the houses are felt I cut to size. For the numbers I used a permament marker. 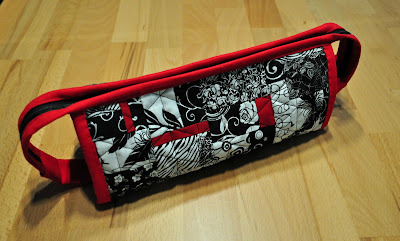 For the pillow case I sewed a zipper to the back center, so taking out the inlet is easy. I used a normal, square 50x50cm pillow inlet and just stuffed it into the corners to give the pillow it's form. I've heard it's impossible to sew just one Sew Together Bag. 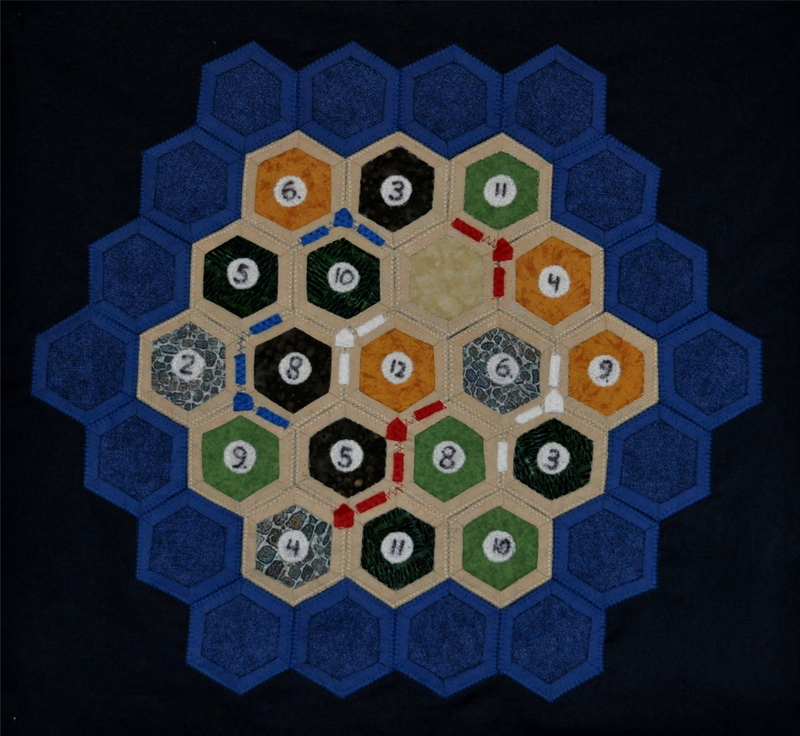 So here's no.2 in blue. I used 2 inch squares to make the outside, making the bag a little wider than the pattern asks for. 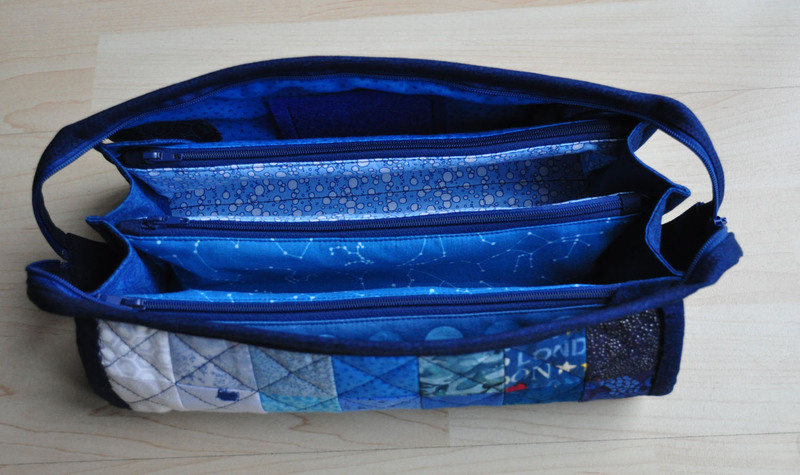 For the inside I used lighter blues for the large pockets and darker blue for the zippered pockets. Hmmm, what to do for no.3? Or sometimes I try something out, not so much because I need it, but because I want to see how it works. 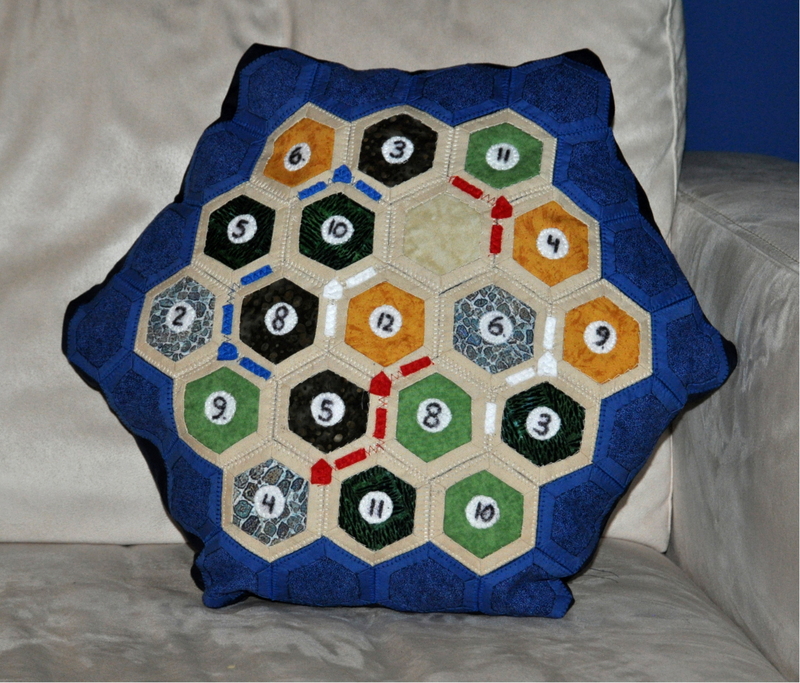 Which means I always have a couple of blocks or patchworked stuff I don't really have a home for. I call those lonely blocks 'Orphans'. A while back I stitched a couple of them together in two pieces 70 x 55 cm, planning to eventually make a bag for my cutting mat and maybe with a couple of extra pockets for various rulers. 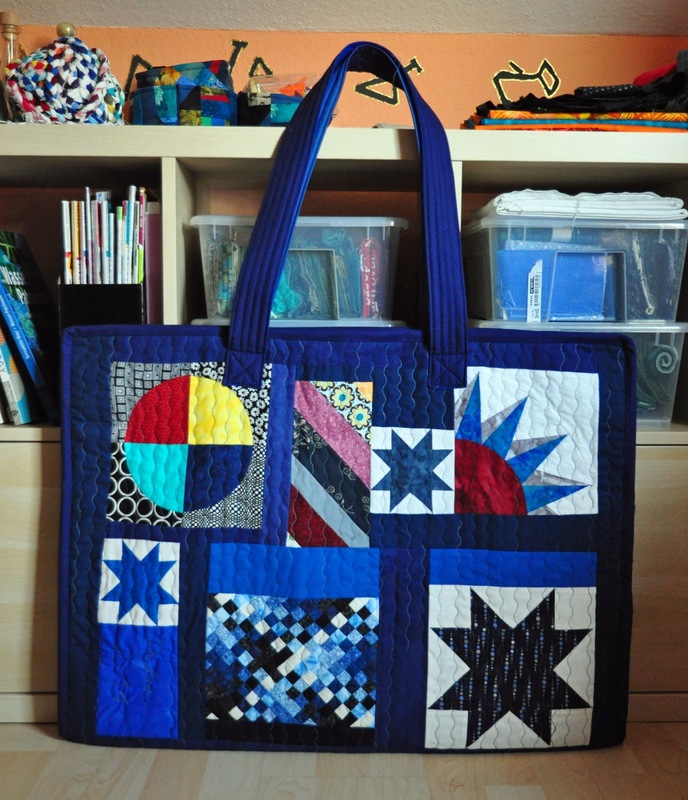 I didn't have a pattern (I did look at quite a few bags on the 'net but didn't find anything I really liked) so in the end I made something up that works for me. This is the front containing blocks from an abondond drunkard path project, a test patch from my light house wall hanging (ticker tape), some 'Oh My Stars!' 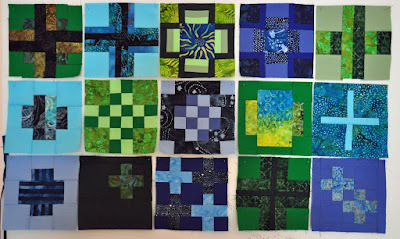 blocks and one of the blocks I did two years ago on the quilting cruise (Nordic Star). 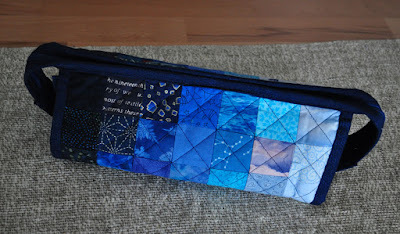 The other front has the other half of the drunkard path project, a New York City Beauty block (again from the cruise), more stars, some weaving I did and a bit from a scrappy strings quilt, that never got past four blocks or so. The handles are long enough to carry the bag comfortable over my shoulder. Maybe it's not the most profesional bag in the world, but for the purpose it's intended for it's perfect. And I found a good home for at least some of my poor orphans blocks. Sometimes there are patterns too strong for me to resist. 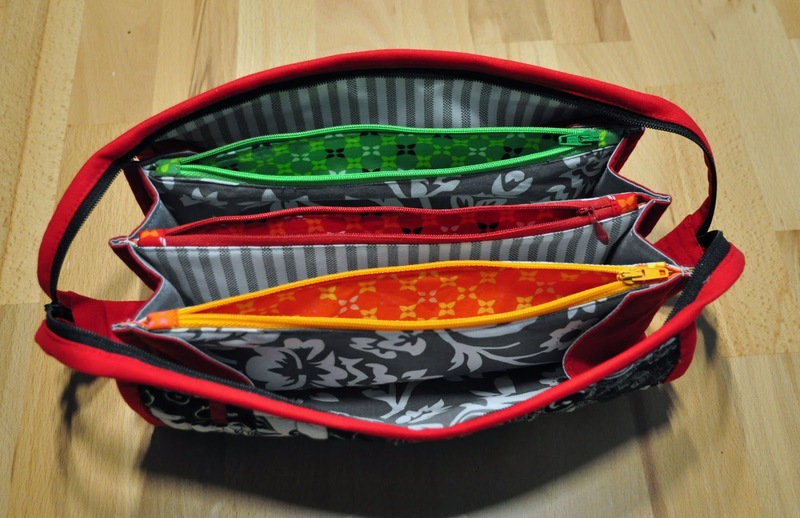 Case in point: the Sew Together Bag by Sew Demented. I've seen the bag all over the internet and eventually I caved in and bought the pattern. 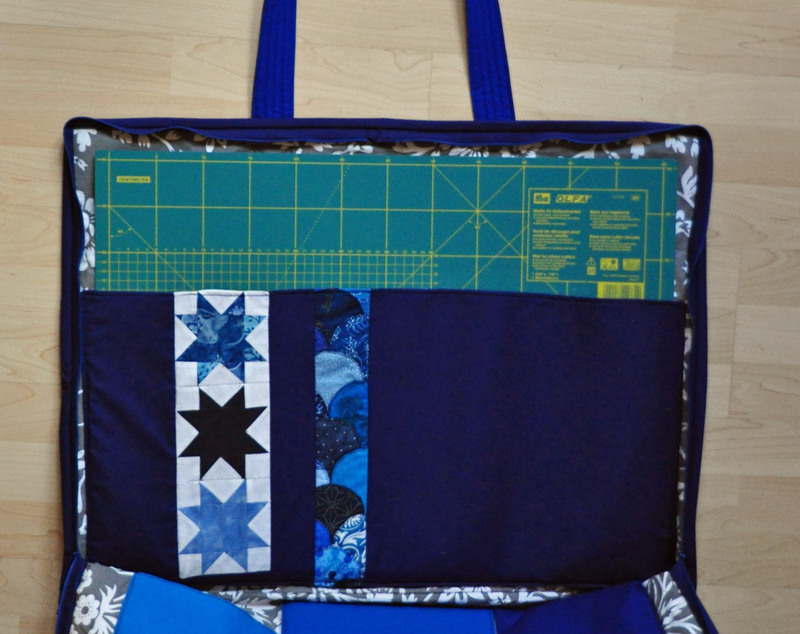 It's a bit fiddly to do in places and the sew along by the Quilt Barn was invaluable. I'm super happy with the outcome. And then there's another project that's all the rage on the 'net (well, at least it was last year - I'm a bit behind with things like this). 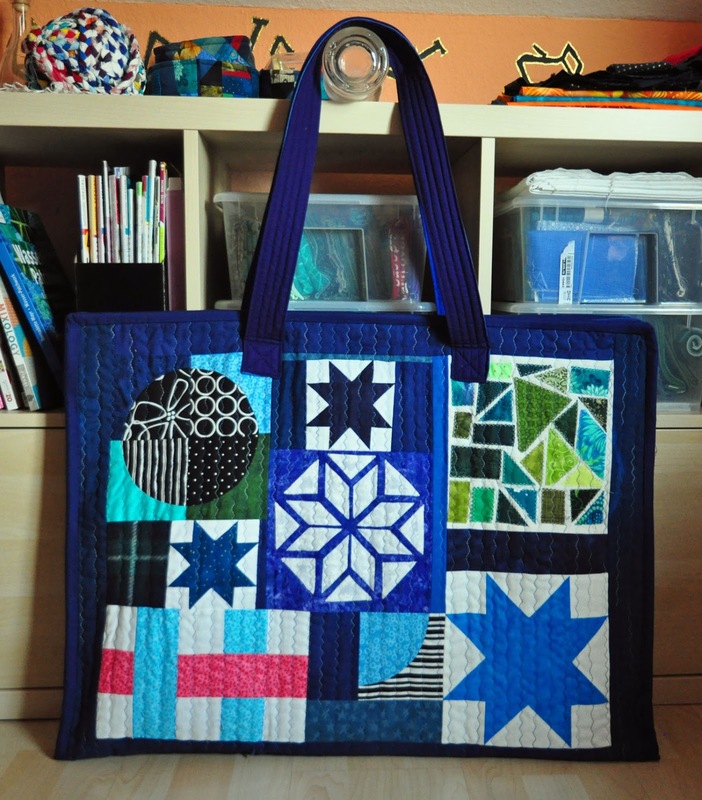 The Tula Pink City Sampler. I've bought the book a couple of months ago and I'm using blue and green solids (I've got a FQ pack last year in the US) plus my blue and green batics. 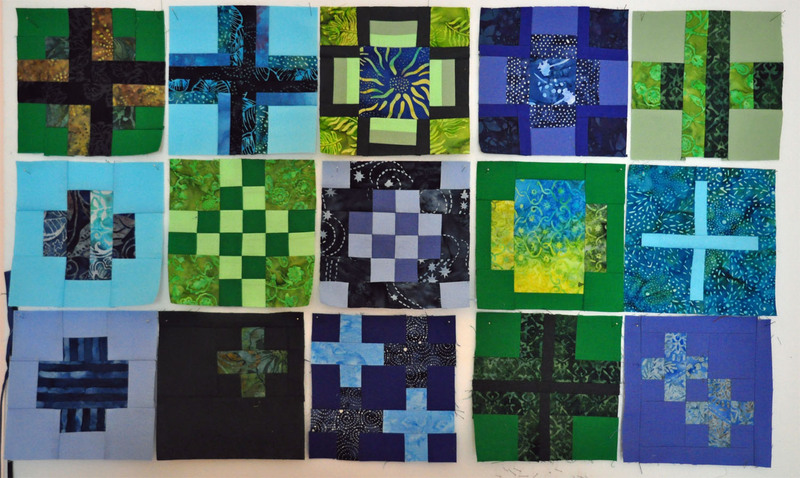 Those are the first 15 (out of 100) blocks: I'm now done with the crosses and will start next with rectangles. I'm going to link to Crazy Mom Quilts Finish It Up Friday.